Our Story - Donaldson Funeral Home, Inc.
Donaldson Funeral Home Continues to Serve the Community for over 75 years under new ownership. The Donaldson Funeral Home, Inc., located at 100 North Main Street in the Village of Massena, has been serving families at their most vulnerable time of need for over 75 years. Beginning in 1933, Vernon J. Donaldson, joined Lodus Brookhover at the funeral home at 33 North Main Street. 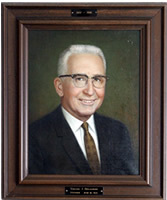 In 1941, he along with his wife, Evelyn, purchased the home of her grandparents, converting it to its now established location. Throughout many years with their sons, David and Gary, longtime dedicated employee, Bruce P. Bombard, and in the most recent ten years, Chad W. Green, they have given “Personal, Yet Professional” funeral service to many. On January 1, 2010, the tradition of a locally owned funeral home continues at the Donaldson Funeral Home, Inc. with the retirement of the Donaldson Family and the sale of the corporation to Chad W. Green, an employee for the past 10 years. The Donaldson Funeral Home is fully handicap accessible and provides funeral services to all religious and ethnic denominations. With the one of the largest casket and urn selection rooms in the North Country, we offer all types of funeral service options, from traditional burial to cremation; we are sure to be able to assist you in your funeral service needs. 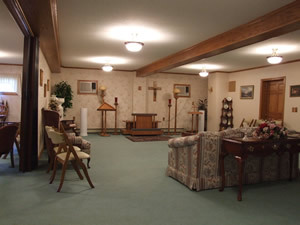 Our funeral home currently has two parlors available to our families, an arrangement area, a full casket, urn and vault selection room, a clergy room, and a handicap accessible bathroom on the main floor of the facility. In addition, we have the availability to handle visitation and funeral services at the family home. We have been long standing members of the Massena Chamber of Commerce, St. Lawrence County Funeral Directors Association, New York State Funeral Directors Association, and the National Funeral Directors Association. Since 1933, the Donaldson Funeral Home has served families from the Massena, Hogansburg/Akwesasne, Brasher Falls, Norfolk, Louisville, Raymondville, and Bombay area in Upstate New York with "Personal, Professional Service."